The College Guidance program at Beth Tfiloh begins in the ninth grade. Prior to the beginning of High School, students are encouraged to enroll in the most challenging classes available to them. Continuing through High School they are counseled by academic advisors who see to it that they are placed correctly. In the Eleventh Grade, students begin the more formal college guidance process. They meet with the College Guidance Counselors as a group and as individuals to map out strategies for preparing for the college admission process. Standardized testing for college begins with the first PSAT administration in the 10th grade. In the Eleventh Grade, students are again given a PSAT exam. This is the exam which qualifies a student for the National Merit Scholarship competition. After January of the Junior year, students will work with the college counselor to plan a test taking schedule including SAT Reasoning, SAT Subject Test, and ACTs. We administer SAT and ACT exams on every available Sunday test date. Each fall, representatives from various colleges come to Beth Tfiloh to meet with our Juniors and Seniors. At Beth Tfiloh, we urge students who are eligible to enroll in Advanced Placement Courses in the various content areas. We administer the AP tests each spring as scheduled by The College Board. It is our feeling that each student deserves a personal advocate as he or she applies to post secondary programs and we have made this advocacy a priority. The results have been extremely positive and our students have gone on to enroll at many of the country’s most competitive institutions. Beth Tfiloh Students and parents will be offered the opportunity to participate in the Association of Independent Maryland Schools’ (AIMS) College Fair in the spring of their Junior year. Also, we will offer additional programs focusing specifically on the college admission process. Matters relating to financial aid will also be raised at these meetings. 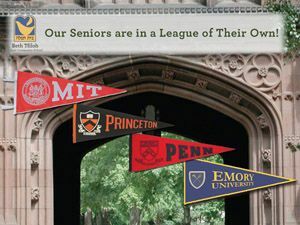 At Beth Tfiloh, we encourage our students and parents to consider the quality of Jewish life on campus when choosing colleges and universities. We also discuss the options available for study in Israel after graduation from High School. Members of the faculty will be actively involved in helping our students and parents make informed choices with regard to Jewish life on campus and Israel programs. If you have any questions or concerns, please contact our Test Coordinator, Mrs. Debbie Allen, at 410-413-2444.